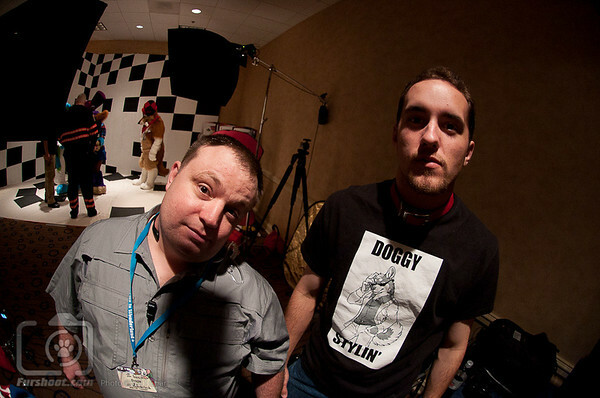 The Furshoot team has been bringing the party to furry conventions since 2008. We'd love to bring the show to your next convention or event. It all started when I was getting my first fursuit back in 2007 and decided to barter some of my photographic skills with RooFurs to get a discount! haha. Within a few months suiters were asking to come to my studio and get good shots of their suits. Then I made a photo badge for my buddy Woofer…. and that was it. OMG THATS SOOO COOL CAN I HAS ONE!? Next thing I know we are shooting as a dealer at RCFM and selling photo badges. We had a blast, the suiters had a blast… it was awesome. FWA recognized the potential of what we were doing and invited us to FWA 2009 - Safari. We built a fake tiki hut, built some props and the version of Furshoot that you know and love today was born. Since then we've been making sets and entertaining suiters every year. We are currently expanding our range and working beyond FWA bringing the show to Megaplex as well. If you'd like to be the next convention to have the official Furshoot Experience use the contact page to get in touch with us.